If you follow me on Instagram stories at all (@elletrain) you know I love to cook and bake. My grandmother was an amazing Southern food cook and baked the most delicious desserts. My stepmother is half Italian, and has always cooked and baked fabulous holiday treats and special birthday meals. My youngest brother works in the food industry and is an avid fan and tester of all of Alton Brown’s recipes. My mom is an incredible cook who has hosted international dinners in her home, where she’s researched traditional foods from various countries to serve to complete strangers (#brave). I think it’s in my blood. I didn’t used to love to cook, but being surrounded by such wonderful foodies in my life, I had no choice but to take up interest. Once you spend a little time trying out recipes and building your repertoire of kitchen tools, you learn the genuine satisfaction that comes with making a delicious meal or treat. I know many of you out there probably share my interest or know someone who does. For you or them, a great kitchen tool is really a priceless gift that will be used again and again. Here, I’ve tried to gather useful, beautiful kitchen gifts that I would absolutely love to receive this Christmas. They’re also all available with Amazon Prime shipping, so you have time to order them before the holiday. From mixers to cookbooks, there’s a little something here for every price point and every cook. KitchenAid Hand Mixer – I adore my KitchenAid stand mixer, but sometimes you want to quickly whip up a small batch of something or just don’t need the full power of the big mixer. This is when a hand mixer is SO handy. #punintended This is currently at the top of my kitchen wish list…and this color. I die. 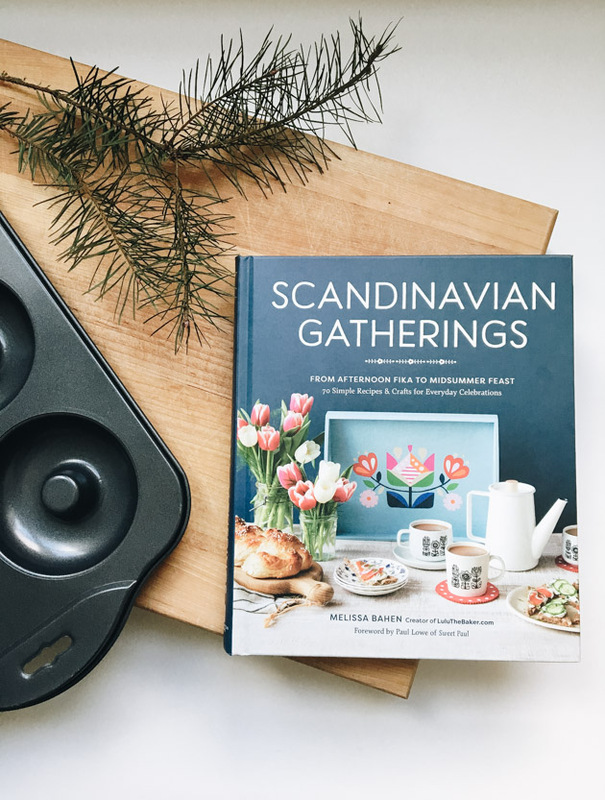 Scandinavian Gatherings – This beautifully written and photographed book is by a friend of mine, Melissa Bahen, of Luluthebaker.com I bought this as a gift for someone and finally got to sit down to look at it in depth the other night. Now, it’s in my Amazon cart for myself! It’s incredibly cozy, lovely and includes both recipes and beautiful handmade crafts for the home. I cannot say enough good about it. A wonderful gift. Salt Cellar with Flip Top cover – I started using a salt cellar a couple of years ago and it’s a wonderful way to store your salt. It not only allows you to easily season by hand or by measuring spoon, but it keeps moisture out of your salt. Being in a damp climate I appreciate that. LOVE this one that has a flip top lid. I may have to upgrade. Oggi 4 Piece Copper Bartender Set – Because the cook needs to stay hydrated…and this is just too insanely lovely to pass up. Any cook who also enjoys a cocktail would appreciate a lovely bar set. Architec Purelast Prep Bowls – The more I cook the more I realize how handy prep bowls are. Having all of your ingredients at-the-ready prevents burning or mistakes in cooking. These prep bowls are not only adorable and useful but they’re made out of recycled material. Helping the earth, one gift at a time. Chambray Crossback Apron – I reaaaaaally want a Japanese-style cross back apron. They seem so much more comfy than a tie-neck which seems to either pull on your neck or fall down. This would be a really lovely gift. Wilton Nonstick Donut Pan – A donut pan is superfluous, you say? Bah, I say. Because homemade baked donuts are the best things in the entire earth. Especially using this recipe for French baked donuts with lots of cinnamon and nutmeg. OMG. You could get really nice cinnamon and some fresh nutmeg and print out a nice copy of this recipe to add to the pan for a great gift for your favorite baker. Boos Maple Wood 20″ Cutting Board – A nice, heavy cutting board is the best thing to have in the kitchen. It stay puts when you’re chopping and it will last for years. Messermeister Ceramic Knife Sharpening Tool – Pinky is a pro at keeping our knives sharp in our kitchen. It’s become his ‘thing.’ This sharpener was one of the few things on his Christmas list this year. Ceramic does an amazing job at sharpening your knives cleanly and a sharp knife means less work and less injury in the kitchen. Nordic Ware Scandinavian Silver Dollar Pancake Pan – Being the designer I am, it bothers me when I can’t make perfectly round pancakes every time. I don’t currently have a griddle either, so this pan would solve both of those issues. This and the Scandinavian Gatherings cookbook would be such a nice gift together. Le Creuset 3 3/4 Quart Braiser – I have a Le Creuset dutch oven and adore it. 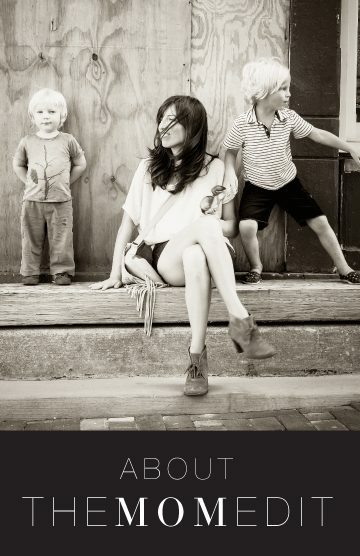 Adore it. I make almost everything in it from soups to roast chicken. It cooks so evenly and wonderfully and goes from stove to oven with no issues. I’d love to add a braiser to my arsenal for browning smaller meats and cooking dishes like risotto. This version is updated with a 500-degree proof handle. These pieces seriously last forever and clean up easily. Little Flower: Recipes from the Cafe – Chosen by Food52.com as one of the 16 best cookbooks of 2012, Little Flower showcases favorite dishes from Christine Moore’s Little Flower cafe in Los Angeles. I have a few friends here who rave about this book. Also on my wish list. Oggi Copper Spoon Rest – Looking for a small something else to add to a cook’s gift? A lovely spoon rest is such a useful addition to the kitchen. I hate setting my spoon on the counter and this lovely copper piece would be pretty sitting out all the time. KitchenAid Artisan Series Stand Mixer – The workhorse of a baker’s kitchen, this mixer is tops. There are endless attachments that are available for it and it will be something to pass down to children, maybe grandchildren. It comes in a variety of gorgeous colors and makes mixing even large batches of bread dough a breeze. Pinky got me this mixer for our first Christmas together and I couldn’t have been more excited. Sienna and I are making gingerbread cookies tomorrow and I’ll be using this bad boy. It’s just a fabulous tool to have. Lastly, I had to update this and say…WOW. My new favorite kitchen item is the Instant Pot. 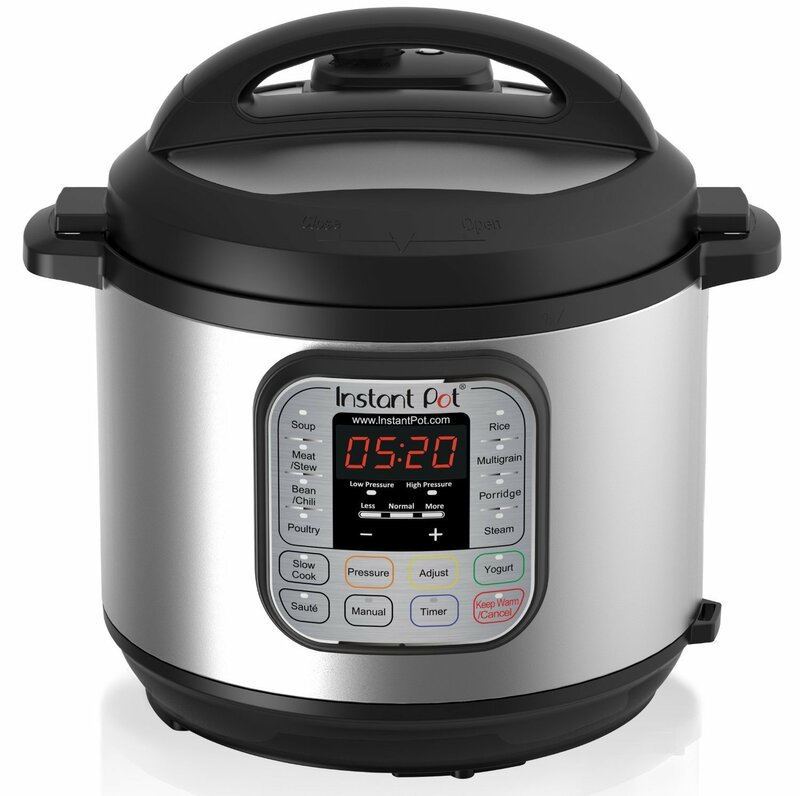 You’ve probably been hearing a bit about these things, but they are a slow cooker, pressure cooker, rice cooker and steamer all in one. They cut cooking time down by a whopping 70%!! We made tikka masala in ours last night in 20 minutes. I made steel cut oats this morning in 10 minutes, and I didn’t have to worry about boil-over or watching the pot. They hard boil eggs in no time that are much easier to peel, and you can make a bunch at once. It usually takes hours to make stews and soups and dishes like that, but you can make them in under an hour in this baby. You can make rice in like 5 minutes. I’m going nuts over this. We just started using ours, but wow. I couldn’t rightly do a post for the cook without including this. The food is apparently healthier in it, too, because the vitamins aren’t cooked out through an all-day cooking process. The flavor is pressure-cooked into the food, making it very tasty without a ton of time. Nuts. Going nuts y’all. I’ll keep you posted on what else we make over on my Instagram. Bye, bye old, ugly crockpot! Those of you out there that share my love of the kitchen…what’s on your list to add to your toolset this year? I’d love to hear your favorite things to make in the kitchen, too! Hope everyone is staying warm out there and enjoying some delicious holiday treats, whether savory or sweet. 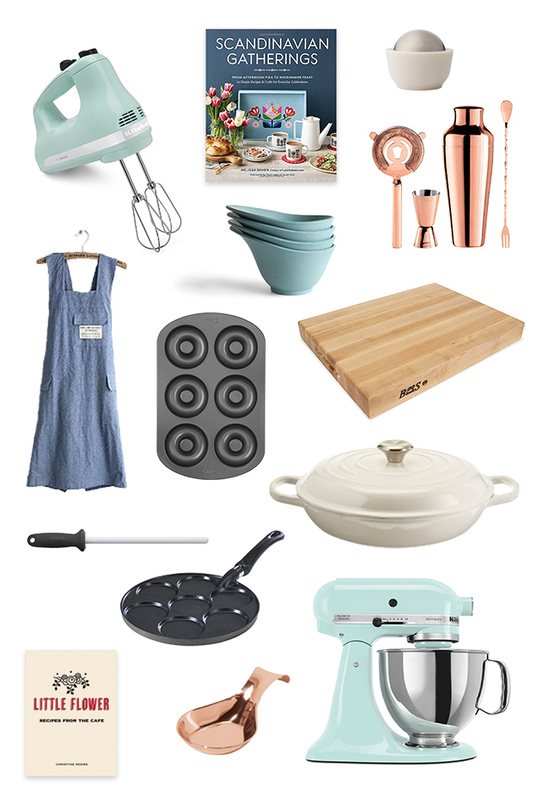 I love this Roundup, especially the gift idea of giving the doughnut Pan and the cookbook! 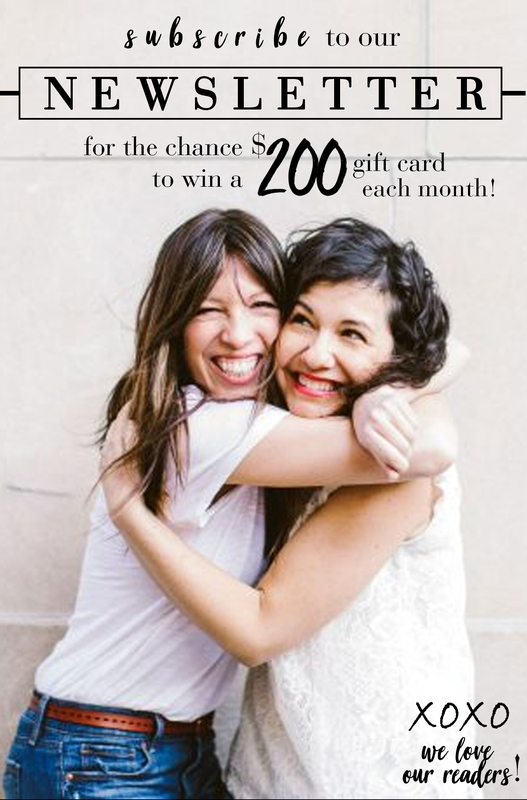 Girrrrl, now I just bought almost this whole post for myself! It’s good to be Santa. Or an adult. Salad hands!! Yes a great stocking stuffer.